Due South of Fort Neugrad. 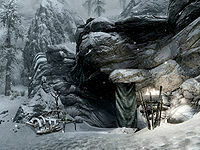 Southfringe Sanctum is a remote snowy cave that is home to the conjurer Bashnag and his coven. It can be found directly south of Fort Neugrad. The entrance is marked by a lit brazier on a stand to the right. To the left is a table with an alchemy lab, an apothecary's satchel and a set of robes of quickening on top. There is a spellsword working at the lab, who may be so absorbed in their work, they may be easy to sneak up upon. Prior to entering, to the north of the cave is a silver ore vein, beneath a rock overhang. Continuing to the north, at the cliffs where one can overlook Fort Neugrad is a tree, with a skeleton you can't interact with and an unlocked chest. In front of the chest is the Conjuration skill book The Warrior's Charge and on the skeleton is an iron war axe. Due west, uphill behind a large rock outcrop is a second silver ore vein. The entrance leads into a natural passage heading west. There is a lantern on the ground shortly after entering the cave; just after this lantern, behind a plant, there is an unlocked chest. After a few paces you enter a small chamber. There is a spellsword patrolling another passage from this chamber to a pair of wooden gates in a wider passage. Use caution as the gates have an frost rune on them. Through the gates is a huge chamber filled with trees, and vegetation on multiple levels. There is a spellsword standing on a ledge to the west of the gates. From the gates two paths lead deeper into the cave system: a path heading west, beneath the spellsword, and another rising to the northwest. 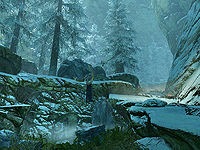 This second path ultimately leads to Bashnag, the leader of this spellsword coven, while the former path leads down to a giant frostbite spider's lair, through a system of caves infested with more frostbite spiders. Following the higher of the paths leads past two lit braziers on the ground on your right. Just past the second there's a flag on the left, by a mammoth rib cage. Turning south here and following it forward leads to a unique fox named Pumpkin. Unfortunately the cute little fox is hostile and has likely eaten his last chicken as you pass through the room. There is a small novice locked cage containing a dead chicken behind Pumpkin, with two raw chicken breasts beside the cage. Beyond this is a spellsword who is either working at an anvil or mining an iron ore vein. Beside the anvil is a table holding a pickaxe, a piece of corundum ore, a steel greatsword, a random enchanted mace, a random enchanted boots and two leather strips. There is also a small empty tent nearby. A short distance north of the iron ore vein is a silver ore vein and by a tree in front of this is a large urn, with a burial urn by a large tree stump further north. Returning to the main path and continuing to follow it as it rises, you will encounter another spellsword working at another alchemy lab. By this lab the path turns to the west, before ending at a pair of wooden gates. The gates are novice locked and open to reveal the path descending into an open-roofed chamber. You will find Bashnag working at an arcane enchanter at the end. He, like all the other diligent workers, may hardly seem to notice you. He carries a copy of the Destruction skill book The Art of War Magic. There is a boss-level chest to the right. A short distance before the enchanter, on the left and heading south, is a path that descends; to the right of the path is a small crevice in the rock wall with a lit brazier behind it. You can look through this and spy a spellsword in the room beyond. There is a second spellsword farther back, which enables you to take them out individually. The second spellsword is guarding a pair of wooden gates that block access to the beginning of the frostbite spiders' lair. There are two spiders in the immediate vicinity and an earthen bridge spanning the chamber; from this you can reach a ramp leading up to two egg sacs that can be harvested. Beneath these is the passage that leads further into the lair and another short passage that leads to an area where you'll encounter Selveni Nethri caught in webbing. She's a necromancer who was originally part of Bashnag's coven, but after a falling out was chased and trapped down here. This was after Bashnag cursed her, making it impossible for her to cast any spells. She asks for your assistance in helping her escape, but will only leave once you've cleared the way. There are two more egg sacs in this lower passage. Use caution as there are numerous spiders in this part of the cave system. As you pass through into the next chamber, which is circular, the giant frostbite spider will descend from above. The path follows the outer wall anti-clockwise around the room and descends, passing an unlocked chest on the left. Just after the lowest point, there is another egg sac stuck to the ceiling that you can harvest. From this point the passage rises steeply, before several turns lead back to the start of both paths. Once the caves are completely cleared, you can return and tell Selveni the coast is clear. There is no reward for this misc quest. The cave appears to be very buggy, with odd item placement and enemy behavior. Due south of the cave entrance, following the path to the blocked gate leading to Cyrodiil lies a moonstone ore vein. Two more moonstone ore veins can be found 510 ft southwest of the cave entrance (map). Before heading to the edge of the mountain outside of the cave, at the foot of a tree overlooking Fort Neugrad, there is a chest. A book called The Warrior's Charge is also sitting against the chest, along with a skeleton and an Iron War Axe. A necromantic ritual site can be found north of the cave's entrance if you have the Plague of the Dead Creation installed. See the quest page for more information. Selveni may not leave the cavern, leaving the quest unfinished. This can be fixed by commanding a follower to attack her, which will push her through the door and complete the quest. Using various shouts such as Ice Form and Unrelenting Force on her may also work, as well as using archery. Behind the chest near Bashnag there is a small, but accessible, hole in the wall that goes to the void outside the level. To get back, just walk through any wall (they are all one-way). It's possible to explore the areas above Bashnag's room and enter the void part of the level or get stuck. Sometimes it is not possible to enter the cave. The player moves into the zone where the game should start loading the inside of the cave, but nothing happens. No "To Southfringe Sanctum" label appears. ? To fix this, exit the game (with command qqq) and start it again, loading from where you are just in front of the cave. The cave should be accessible now. If the same happens during exiting the cave, just use coc SouthfringeSanctumExterior. Humanoid NPCs that are working will be non-hostile and only go hostile once interacted with, making them easy prey for sneak attacks and pickpocketing. This page was last modified on 14 April 2019, at 02:25.